Posted by Lorraine Watson in Announcements. 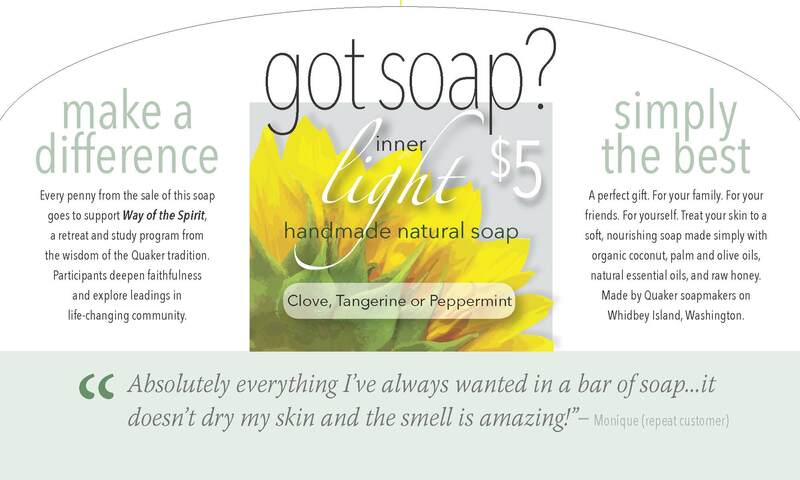 This soap is the perfect gift for your family and friends or for yourself. Treat your skin to a soft, nourishing soap made simply with organic coconut, palm and olive oils, natural essential oils, and raw honey. Made by Quaker soapmakers on Whidbey Island, Washington. Every penny from the sale of this soap goes to support Way of the Spirit, a retreat and study program from the wisdom of the Quaker tradition. Participants deepen faithfulness and explore leadings in life-changing community.